Do you believe in the power of color psychology? We do – since contemporary science provides results of researches that prove the fact color can cause an impact on the person’s mood. So today, we have prepared the collection of 20+ best soft color WordPress themes. You will find lots of WP items on different topics. Here we have female-oriented themes, e-commerce platforms, themes for blogs, and lots of themes for other business niches. All these themes come compatible with a drag and drop composer, which means anyone can build a remarkable online representation without the knowledge of the code. Using customizer options, advanced typography, and widgets you will create a unique website that will impress the wide audience. 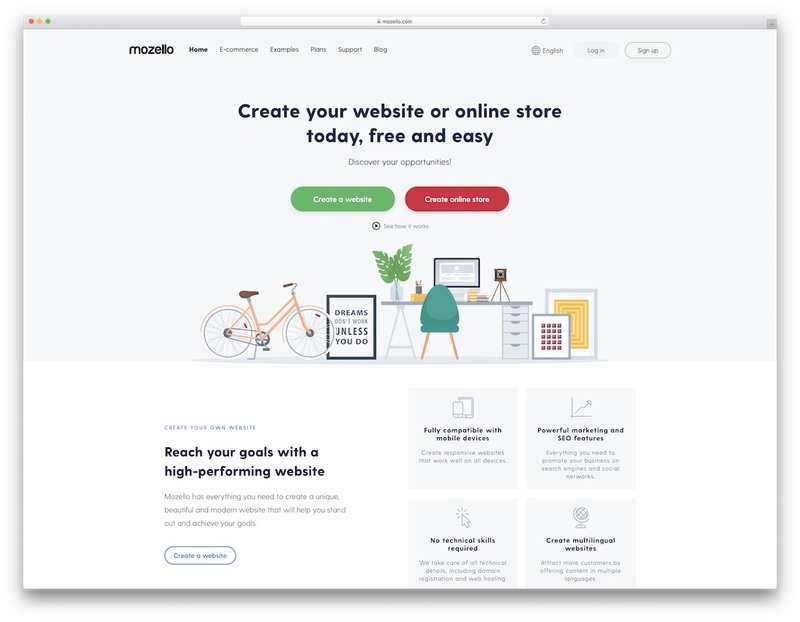 Choose the perfect SEO-ready WP theme to convert more visitors into customers in 2019. Muji WordPress theme is a ready-to-go solution to create usable yet stylish websites for wellness centers, spa agencies, hair studios, beauty firms, and a range of other online projects that are related to the beauty-related topic. The theme’s download package features 2 pre-made layouts and color schemes. Thanks to the availability of Online Appointments management and advanced contact forms, you can make it quicker for customers to get in touch with you and schedule their future visits. The theme runs on WordPress 5.0. It’s made to be fully compatible with GDPR and Gutenberg page builder. Also, it is intended to work flawlessly with a range of premium WordPress extensions. 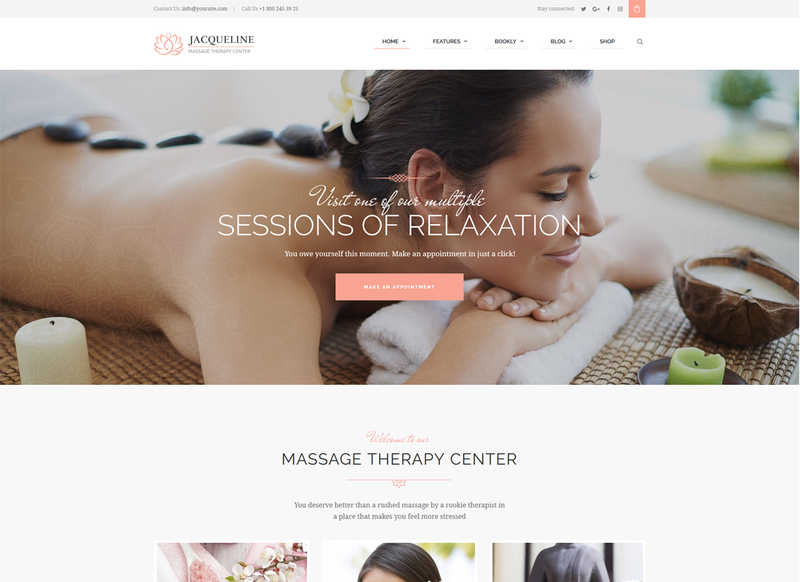 Jacqueline theme is the best item to start the collection of best soft color WordPress themes with. It is made for beauty and healthcare services, however, can be used as a blog or a feminine website as well. It has a versatile skin, stuffed with widgets and shortcodes, that you can use to change the website look with ease. It is a ThemeForest trending item, so you can be confident in the quality of this product. You can manage your content using custom post types, representing services, team, testimonials, etc. 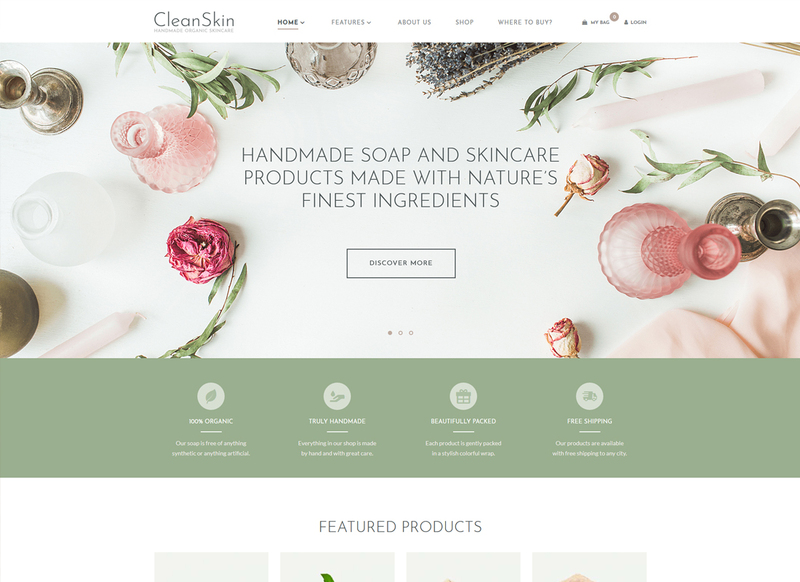 Another beauty-oriented WP theme made in a pastel color scheme is the Clean Skin. This theme has flexible post layouts and gorgeous galleries. It features 3 outstanding ready-made designs, so you don’t need to create a website look from scratch. You will be able to tell the audience about your company using pre-made pages, such as About Us and Where To Buy. Its features list includes Google Fonts, Awesome Fontello, customizable color scheme, and lots of other useful features. 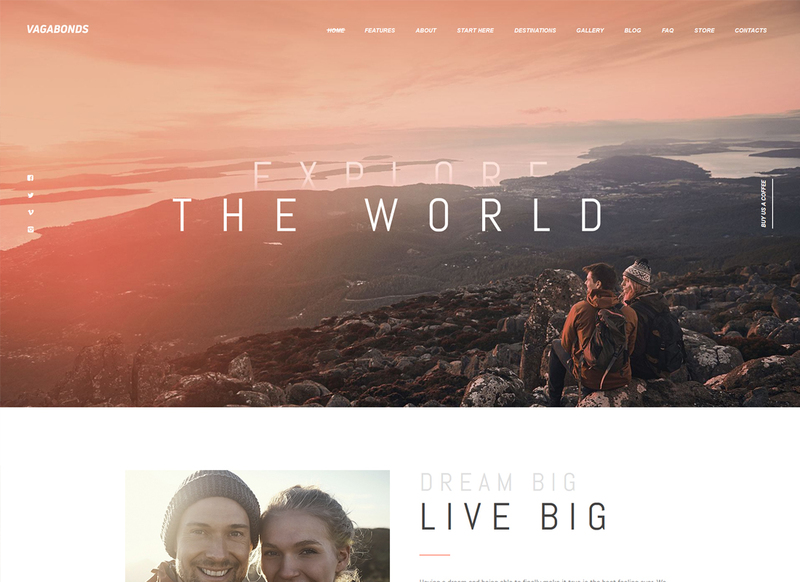 Vagabonds is one of the most spectacular soft color WordPress themes we could find. It is suitable for travel and entertaining blogs, lifestyle blog, or a news website. It is compatible with the Essential Grid and Slider Revolution, which means you have extra options to represent your posts. Vagabonds comes with multi-layout pages with different features. Apart from that, you get the Give – Donation plugin included. It means you can raise funds to improve your blog and create more of fascinating content. 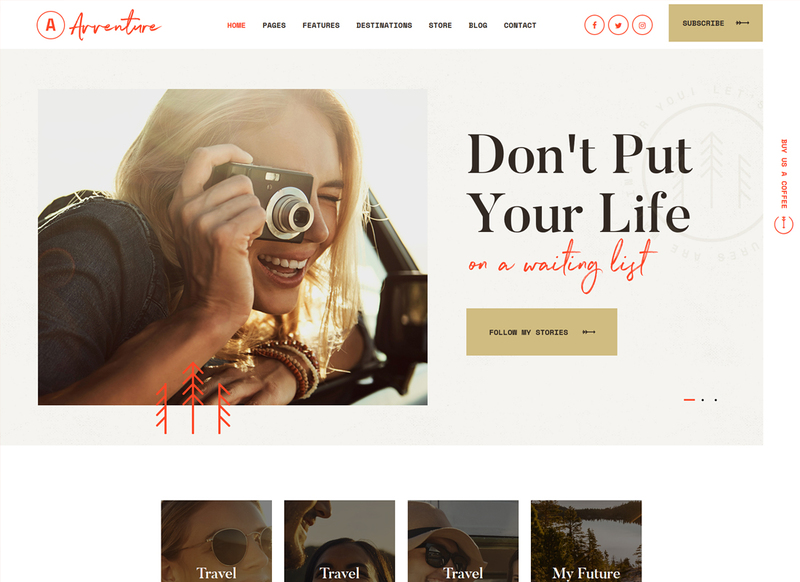 Get yourself one of soft color WordPress themes to start a personal travel blog. Its sleek and simple layout will help you to focus visitors attention on the content you share. This is a premium WordPress theme, so you get tons of awesome tools and options in order to create a unique and powerful website. What we mean, is a compatibility with the most popular WP plugins, such as Elementor, WooCommerce, Events Calendar, Give – Donations, the Essential Grid, etc. You don’t need to be a professional developer to craft pages and change the website look, as the work with a drag-and-drop composer requires no coding skills. Are you wondering what soft color WordPress themes are? Well, you should check out the Jude theme to figure it out. 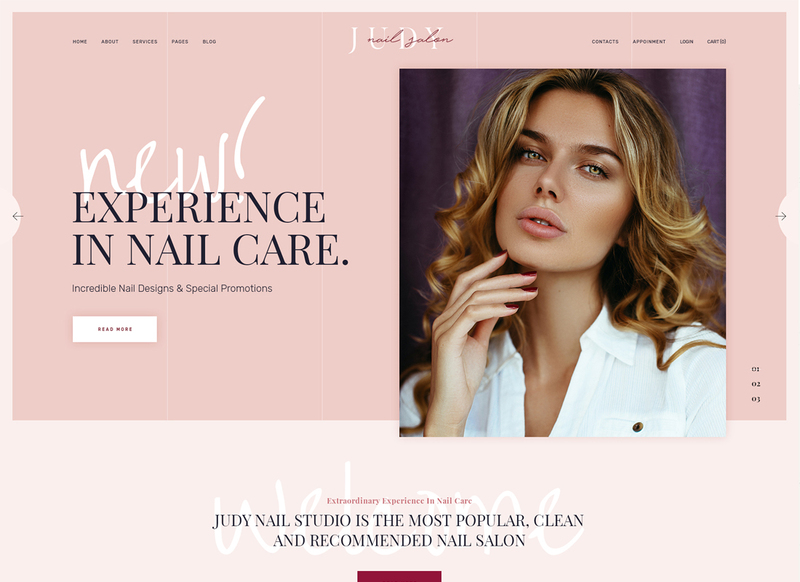 This is a clean and powdery WP theme made for nail service and beauty salon websites. It has 2 responsive Home Pages, each has unique features and adapts perfectly to any device. 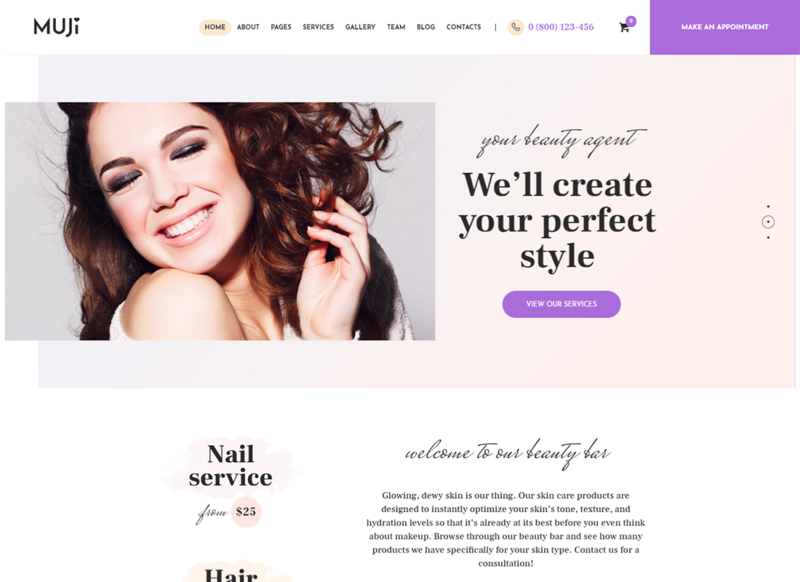 It is compatible with WooCommerce, so you can not only represent your service and share interesting content but also sell beauty products, nail polishes, and manicure accessories through the website. Stylish and creative S.King theme will impress all random visitors at first sight. It comes designed with muted colors. The theme has a 100% responsive and Retina-ready layout, which makes this theme effective in terms of mobile performance. This theme was specially made for personal stylists and fashion influencers. You can use it as a blog or an e-commerce platform. WooCommerce and Slider Revolution will help you to represent your products and services in a positive light. S.King includes the following plugins for free: Visual Composer, Booked Appointments, Essential Grid, MailChimp, and Contact Form 7. 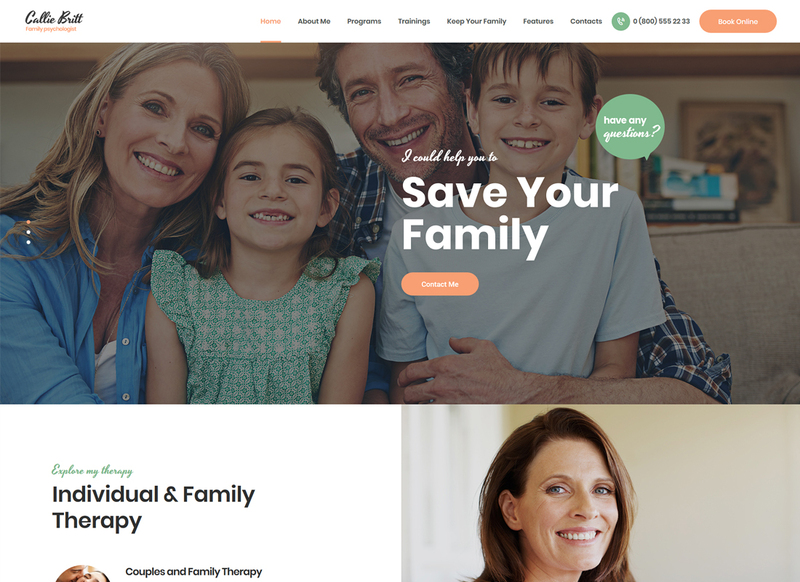 The Mounty is the warm family-focused WordPress theme. Its work based on the powerful framework, so it works great on all devices. 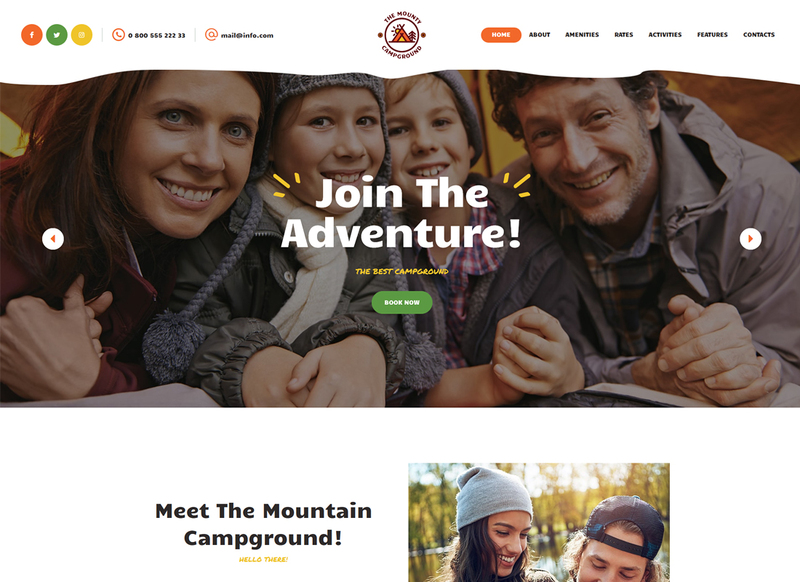 It comes stuffed with features, that will help you to manage your camping website, namely the Event Management plugin, booking and contact forms, lots of ready-made pages, and much more. You won’t spend hours installing this theme, as the One-Click option will automatically import all the theme demo data for you. 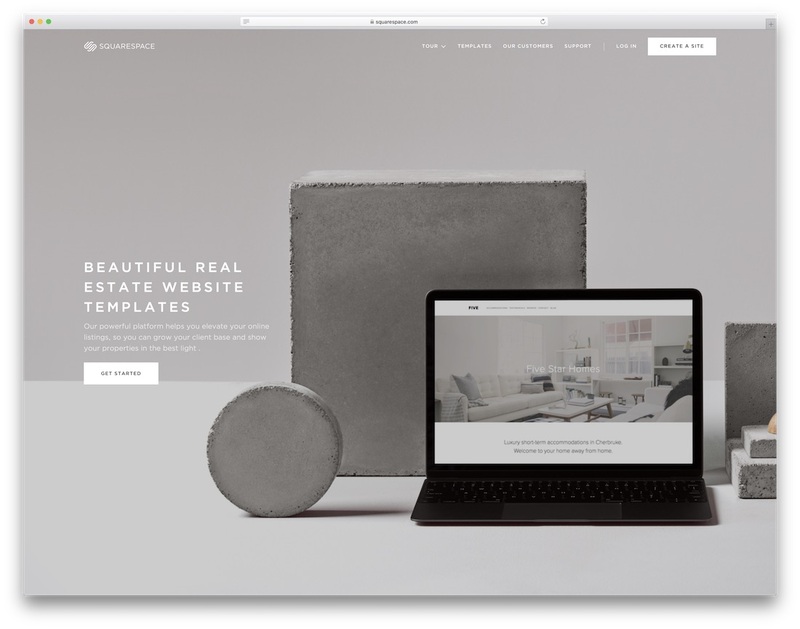 Check out the clean and stylish theme made for entrepreneurs and creative beings. It comes fully-responsive and cross-browser compatible. Moreover, you can get it half-price since it is the holiday discount season. Artrium is a WordPress product that offers a wide range of features, such as WP Customizer, theme options admin panel, shortcodes, customizable Google map, Google Fonts, and much more. Another feature, that makes this website highly effective is a high-quality code. It makes this theme not only fast but also SEO-friendly. Artrium is the theme created by professional developers and designers so you may rest assured in its quality. 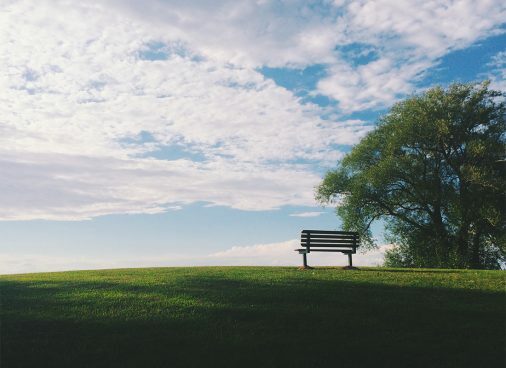 Need a clean and minimal design for a personal blog? 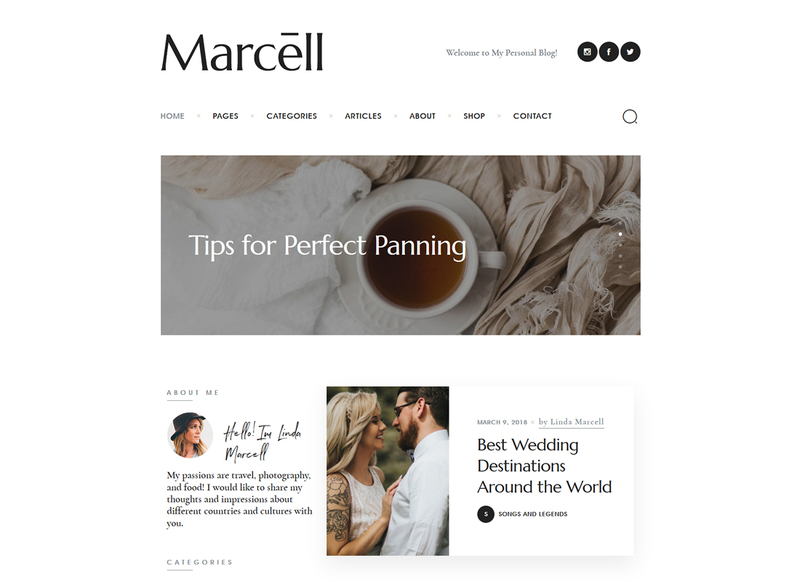 Marcell is an incredible WordPress piece that gives over 20 at your disposal. This theme features all necessary WP plugins, namely Elementor, Instagram Feed, WooCommerce, MailChimp, and Essential Grid. Apart from that, you get lots of ready-made pages, homepages, and shortcodes. This theme would become useful for those who lack coding knowledge since Elementor page builder includes tons of content blocks which you can drag around the page with ease. This theme allows you to connect your website with social media accounts. Sharing buttons and ikons will help you to promote your social media pages and boost the influx of new visitors to your website. A fully-responsive and versatile Ozisti theme is a great choice for any business. Innovative technologies and augmented reality animation will impress the audience indeed. This theme is WooCommerce-ready, so you can sell any type of product or service with it. Use ready-made product pages to save your time and efforts. 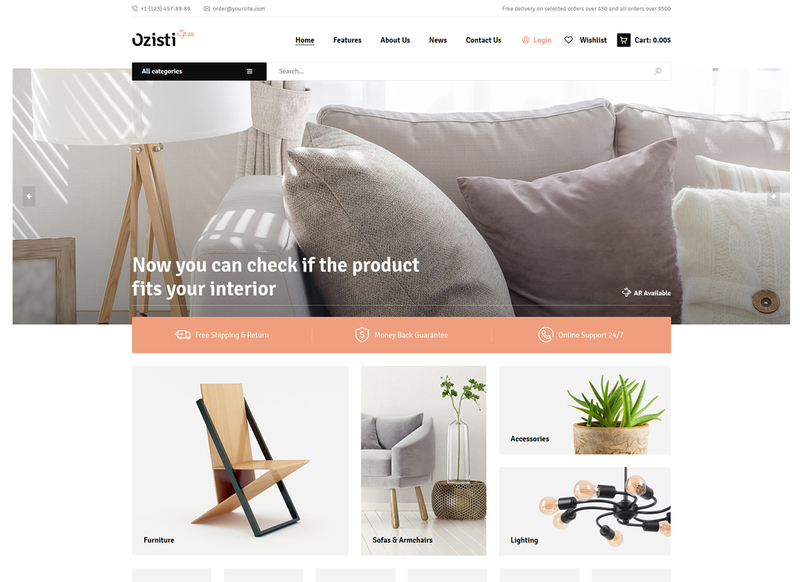 This theme is powered by the most potent WordPress plugins which make the Ozisti theme one of the most effective soft color WordPress themes for online business. 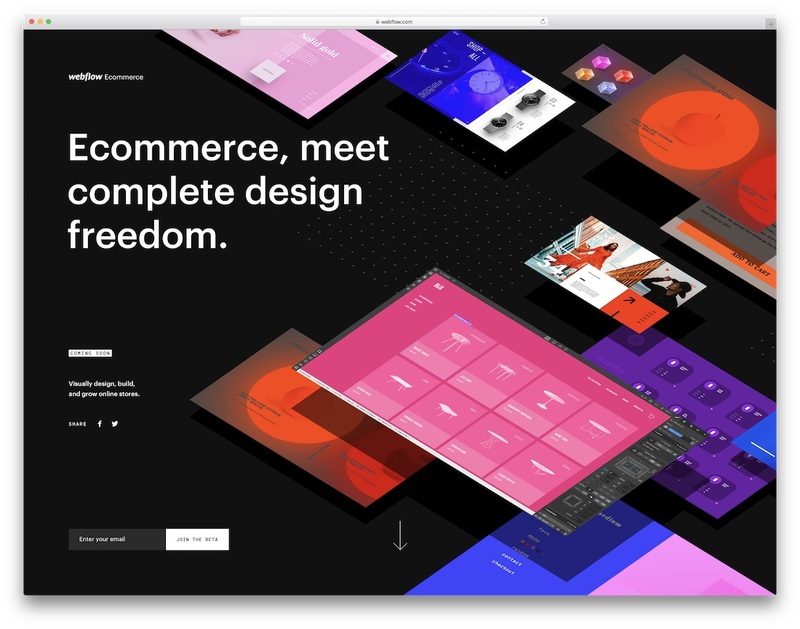 The theme is compatible with Gutenberg, so you can use this drag and drop builder to create the web design from scratch. 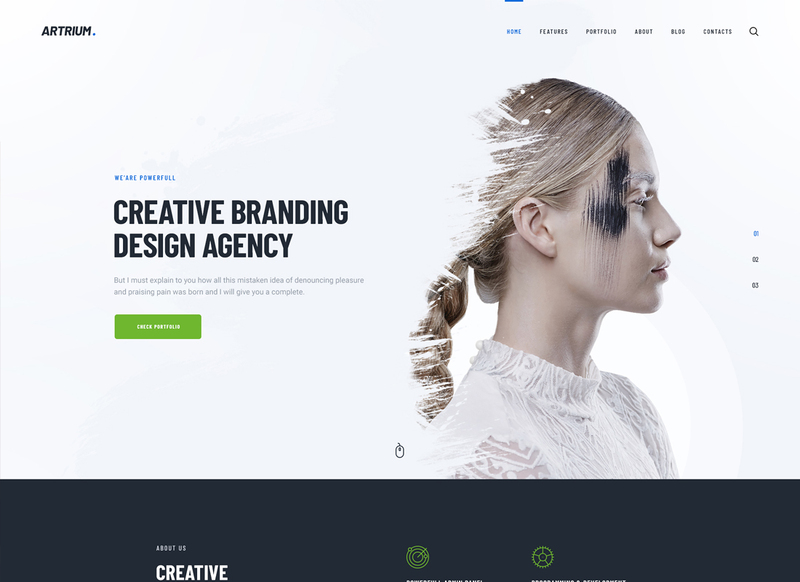 This clean and modish WP theme was made for creative ladies. 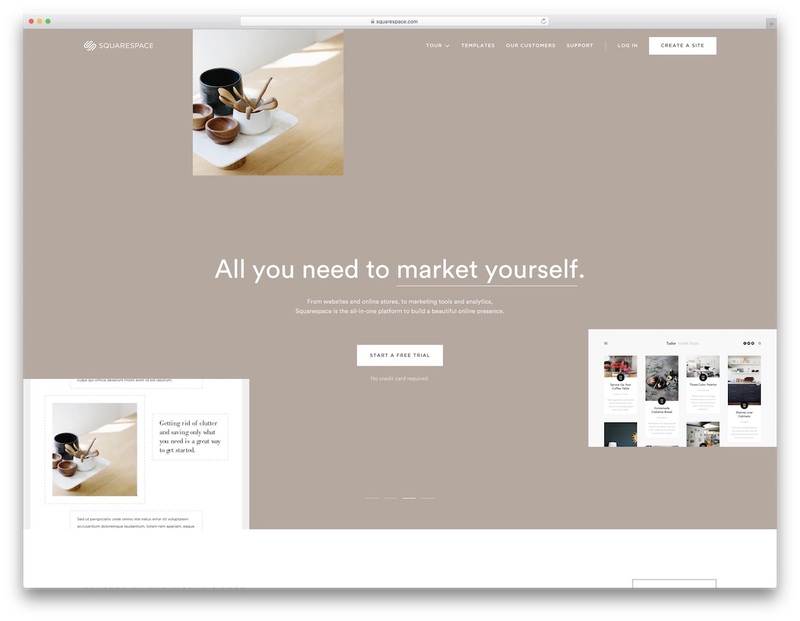 You will get 3 homepages, tons of widgets, shortcodes, contact forms, beautiful galleries, and Instagram Feeds. 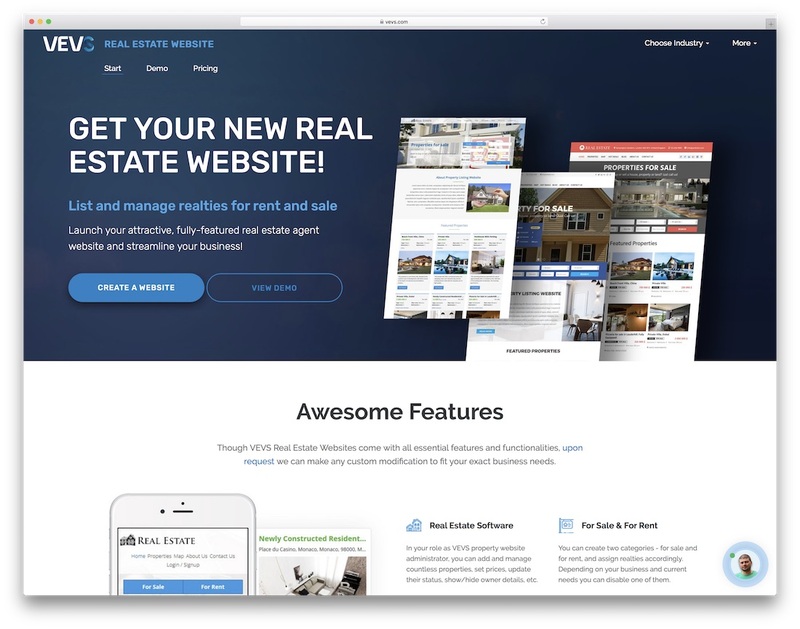 You don’t need to be a professional developer to modify ready-made pages since the drag-and-drop composer requires no interaction with the website code. 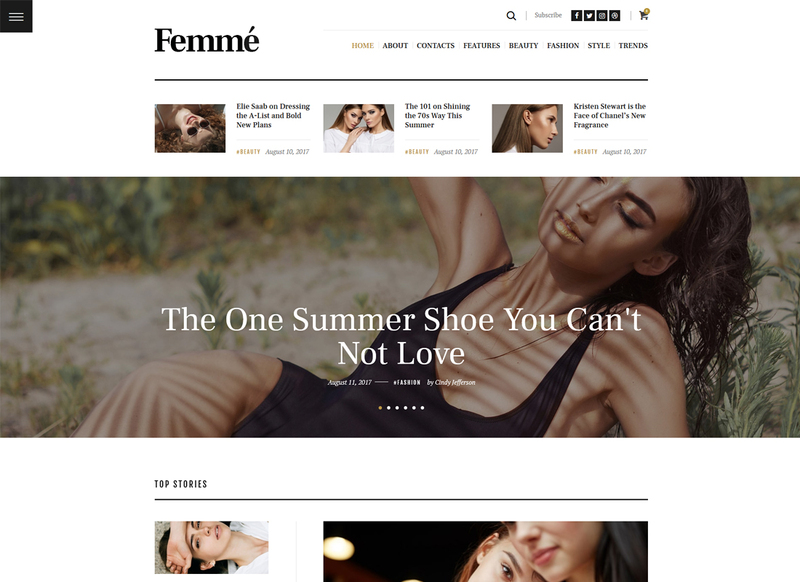 With this theme, you will create the most alluring and unique fashion blog. Its soft design suits nicely any female-oriented project. Create an elegant beauty blog with the tender soft color WordPress themes – ClamChic. The theme has 3 beautiful demos with different features and responsive design. Its layout is flexible and customizable. You can use a premium content composer to change the look of your website without an additional assistance. Its professional design is not only alluring and responsive but also optimized for all popular search engines. Advanced layout features allow you to choose between 2 layout variations – boxed and fullwidth. Use it to start a beauty blog or sell beauty products and fragrances online. 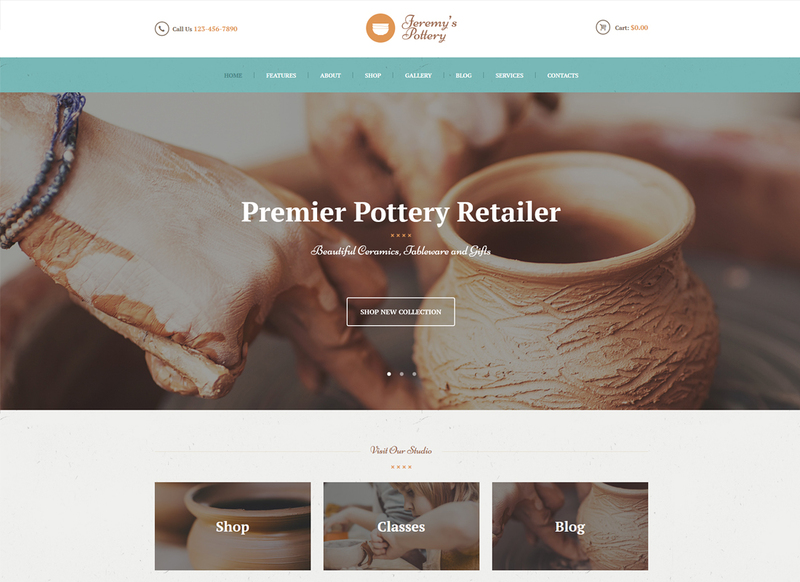 If you want to promote your ceramic studio in style – buy this soft color WordPress theme. It features all needed option that helps to manage the educational establishment, such as classes, events calendar, and services modules. 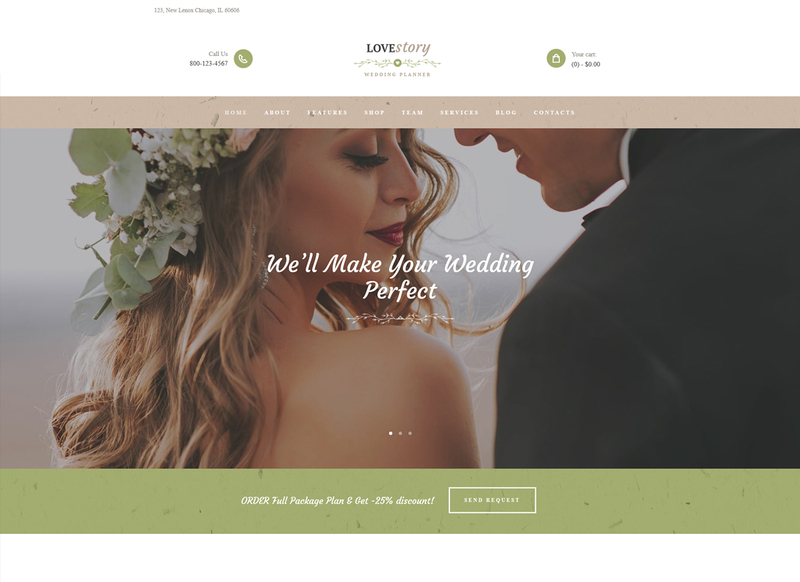 This gorgeous theme has a gallery and blog layout. It will impress you with the level of its versatility since you can even make a custom header using the TRX addons plugin. Its custom widgets set comprises plenty of social widgets, such as Flickr, Twitter, Instagram, social icons, etc. With a wide range of shortcodes, you will create a truly unique website look. In case you find it difficult to work with the read-made WP theme there is a pack of the theme documentation included, so you can find the answers to the most significant questions with ease. 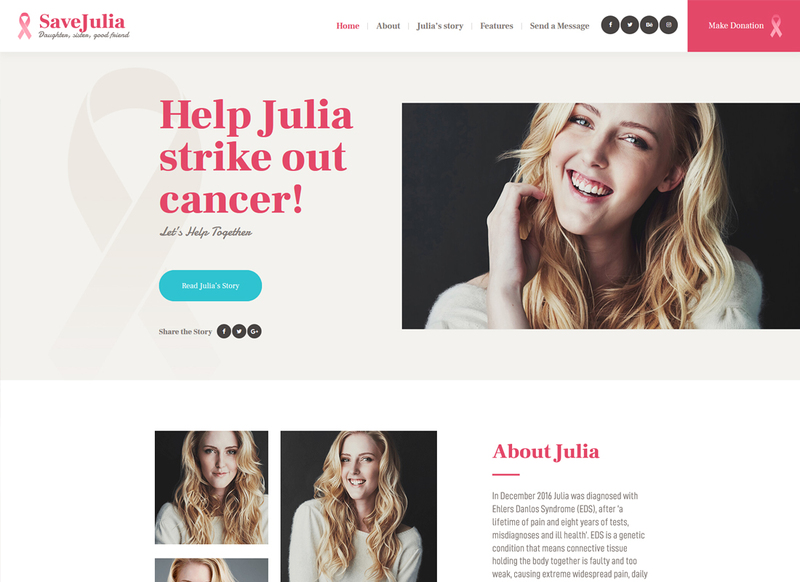 Save Julia is a powerful WP theme for fundraising and any kind of non-profit organization. Of course, it features Give – Donations plugin, which allows raising funds via the website. It comes built with a powerful framework and offers hundreds of customizer options. Speaking of customization, Save Julia has a custom theme options panel, which you can use to adjust the website look on your liking, change the theme color, or use different typography. The ready-made design is mobile-friendly and Retina-ready. This theme is aimed to provoke a feeling of understanding and empathy with a glance. Callie Britt is a responsive soft color WP theme with a modern and clean design. This theme includes plugins, that help to organize the business online. One of such plugins is Booked Appointments, which allows your visitors to make reservations online so that you save yours and your clients’ time. Another outstanding plugin that will help you to become a reliable provider of family counseling services is the Events Calendar. Using this tool, you can create schedules and display the time of upcoming events. Using gorgeous gallery you will create a remarkable representation of your skills and knowledge. Among other soft color WordPress themes – this one is the sweetest. It has a responsive Retina-ready layout which guarantees the best mobile performance for your wedding planning business. Its layout is highly-versatile. You can change its look rather through theme options admin panel or with a drag and drop page builder. The last option works great for those, who have no experience in website creation but has a strong urge to create a beautiful business website in no time. 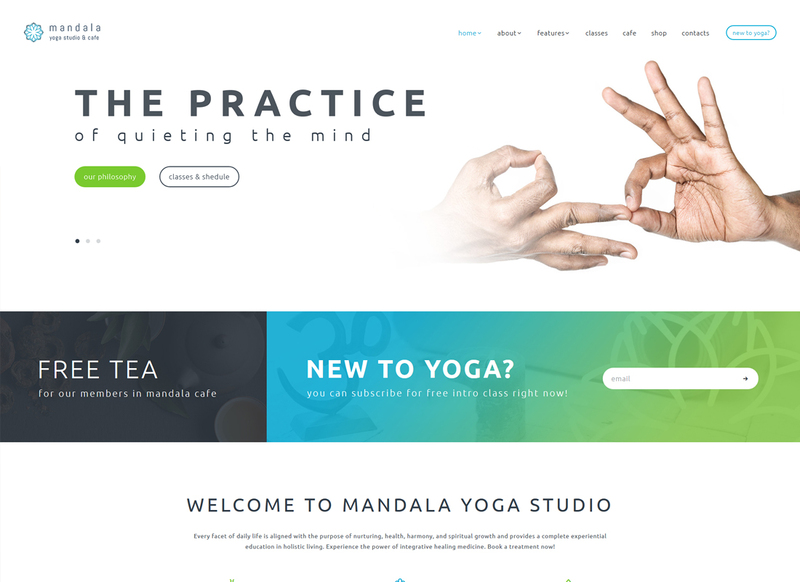 Mandala has a lovely peaceful layout that you can use to represent the wellness center, yoga studio, spa salon, or any even a healthcare establishment. 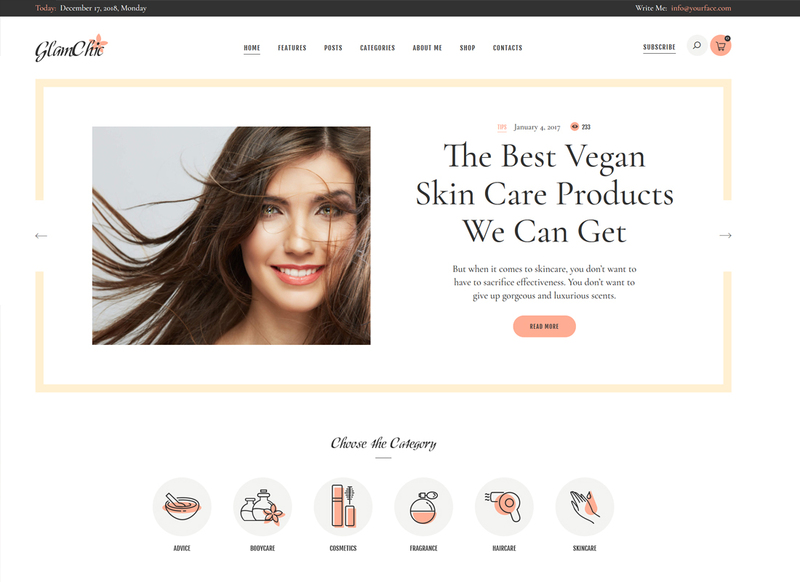 It is a WooCommerce-ready theme, so you can sell body and soul treatment or healthcare products using premade pages. There are different modules included, so you can introduce your team and share testimonials. This theme won’t make you sweat even at the beginning of your work, as it comes stuffed with One-Click Installation feature, which imports the theme data automatically. The vegetarian lifestyle has become a popular movement. With the Rosalinda theme, you can promote it even more. 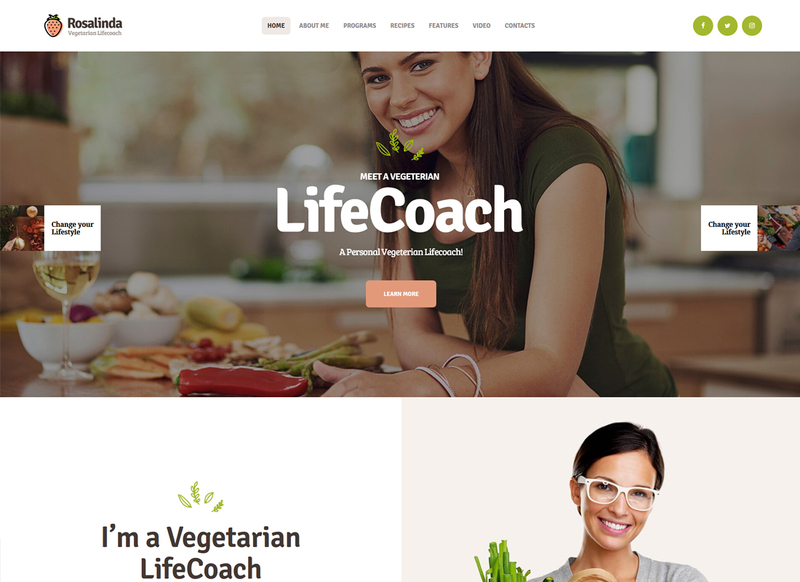 It includes lots of relevant content which work great for health coach services. Another advantage of this theme is compatibility with extremely robust WP plugins, namely Visual Composer, Instagram Feed, Essential Grid, and Booked Appointments. As other themes made by ThemeRex, it features TRX Addons plugin. It gives you an opportunity to use different post types and modify the header and other website areas in accordance with your preferences. Delightful colors and outstanding functionality make this theme a real sweet spread. It has an intuitive interface which is easy to manage regardless of the level of your skills in the sphere of web design. With WPBakery you will create and modify pages on a drag-and-drop basis. Lots of premium plugins, widgets, and shortcodes enhance capabilities of this theme. 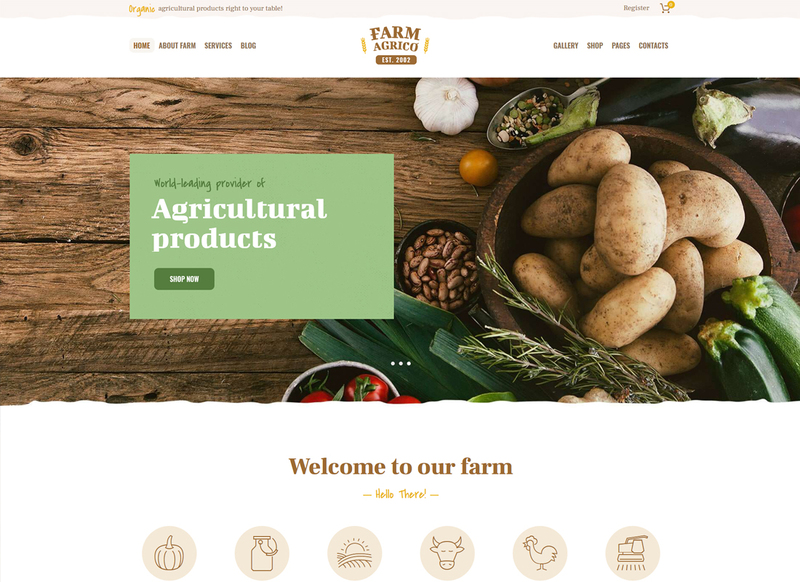 Farm Agrico includes graceful animations and supports Parallax Effect Background. It means your website will be equipped with a smooth scroll effect. The theme documentation and professional support will assist you through this theme and simplify the process of the content creation for you. Dr.Patterson will help you to create an attractive business website. Its fresh and minimalist design suits healthcare niche perfectly. 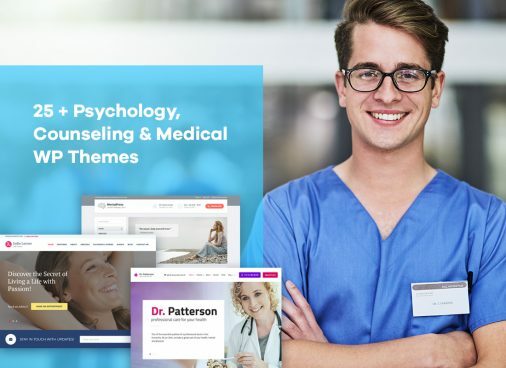 It offers you to take an advantage of awesome theme features, such as 6 premade pages, pre-made modules on a medicine and healthcare topics. With this theme, you can manage post types, modify the header, create custom layouts, and play with the theme color scheme. 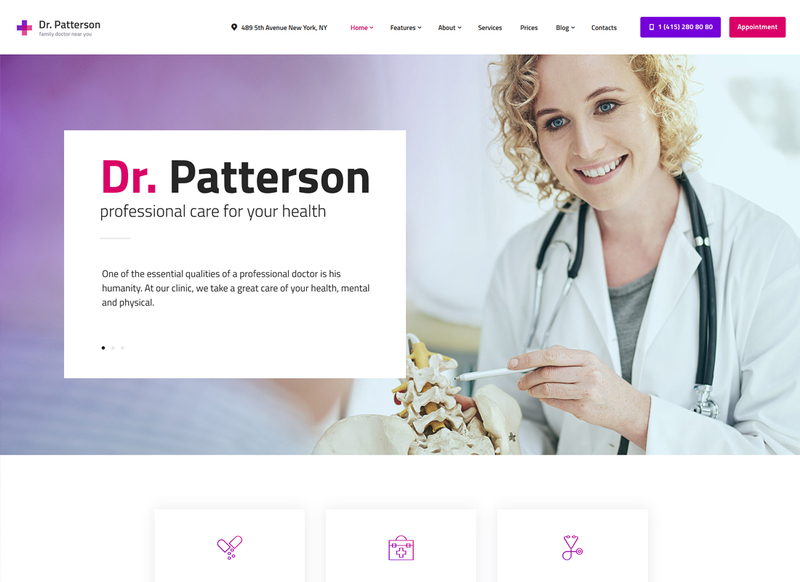 Dr.Patterson is responsive, Retina-ready, and cross-browser compatible theme which makes it effective in the field of mobile promotion. 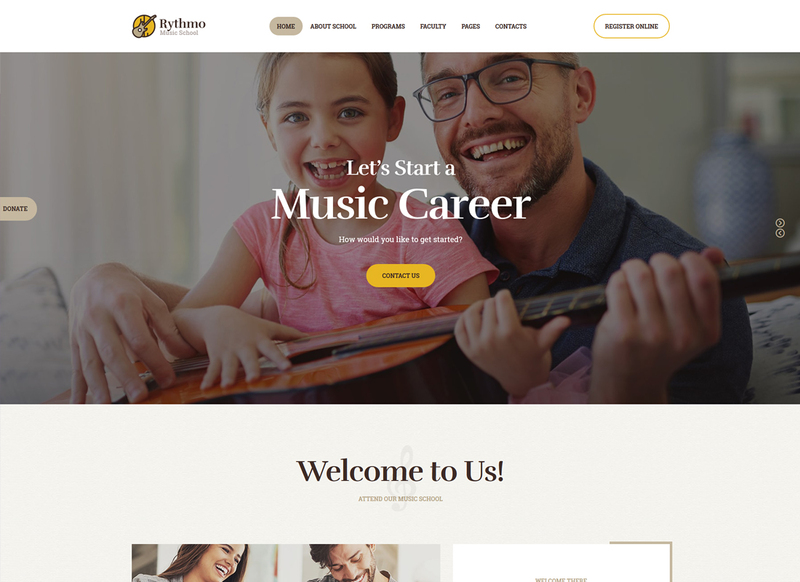 Rythmo is a professionally-made WP theme with a beautiful responsive layout. You can launch a blog, e-store, or open an educational platform online. Rythmo theme has ready-made lessons, classes, and schedule time tables. There are several unique demos that cover different topics. 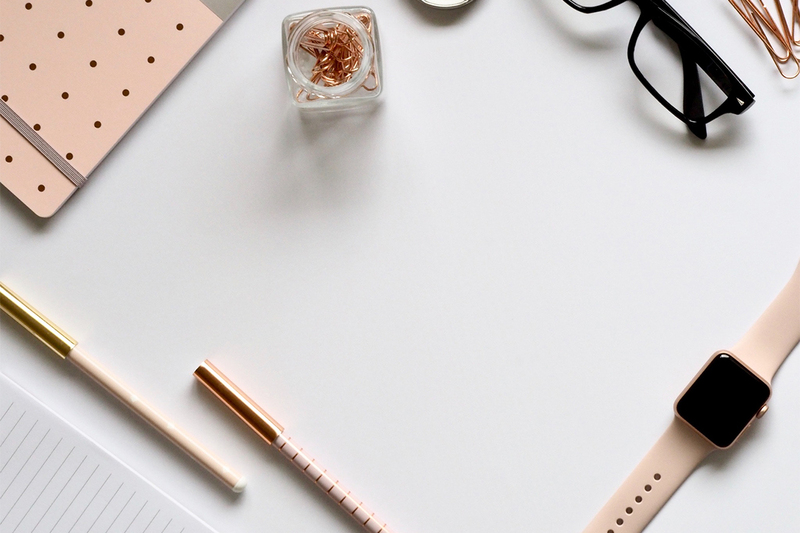 Using the Essential Grid plugin, you can create gorgeous a gorgeous portfolio to show off your skills or share photos from your students’ performances. Rythmo comes built with a clean and valid HTML code, so it works on all devices and search engines. Looking for a fashionable WP theme? Coleo is the best for online fashion retailers. It has a wide range of typography options, plenty of shortcodes and widgets. It is compatible with such plugins as WPBakery, Essential Grid, Slider Revolution, and TRX Addons. You can make your content more organized using custom post types. The sidebar manager supports 7 widget areas, so you can stuff it with ads. Of course, it supports WooCommerce, which means you can create a customizable e-store. The contemporary design of the Run Gran theme is aimed to help you boost the sales level. This theme offers different color options, features advanced typography, and tons of other ready-made solutions. You can launch a blog and share tips and articles on different topics in order to boost your SEO. By the way, this theme has a powerful HTML/CSS code in its core, so any search engine will easily index your website. The last piece in the list of best soft color WordPress themes is this nice and simple theme. 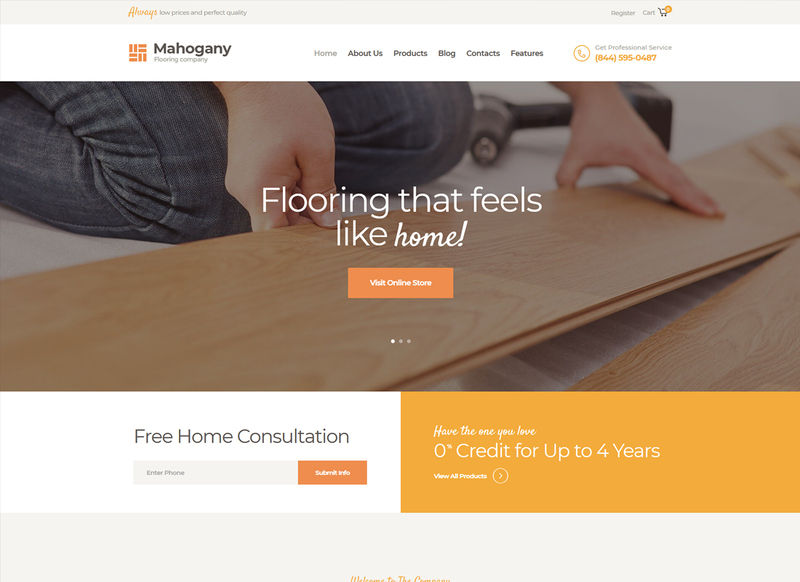 Mahogany is the theme dedicated to helping flooring companies representatives with products and services showcasing. This theme gives you lots of ways for the theme customization, one of which is compatibility with the WPBakery plugin. It requires no coding skills and allows to create custom content with ease. Such tools as WP customizer, shortcodes, and comprehensive admin interface will also help you to create a website of your dreams.